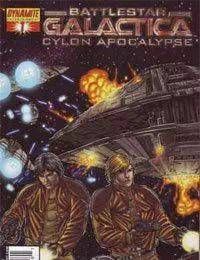 DYNAMITE ENTERTAINMENT presents an all-new, Battlestar Galactica event featuring the DYNAMITE Debut of Javier Grillo-Marxuach (ya know, the guy behind such hit shows as Lost and Medium) as he unleashes the Cylon Apocalypse! Dual revelations rock the rag-tag fleet as a routine Viper patrol puts them on the edge of a bizarre scene - Cylon Raiders attacking one of their own Basestars! As the Cylon Basestar crashes into an ocean-covered world, Adama and Starbuck discover a bizarre creature that appears to be a Cylon Centurion engulfed by diseased flesh. The Cylons are sick and the apocalypse has begun!